Enjoy million dollar views from your luxury carriage house with romantic seclusion, fireplace, and an over-sized, en suite jetted tub for two. 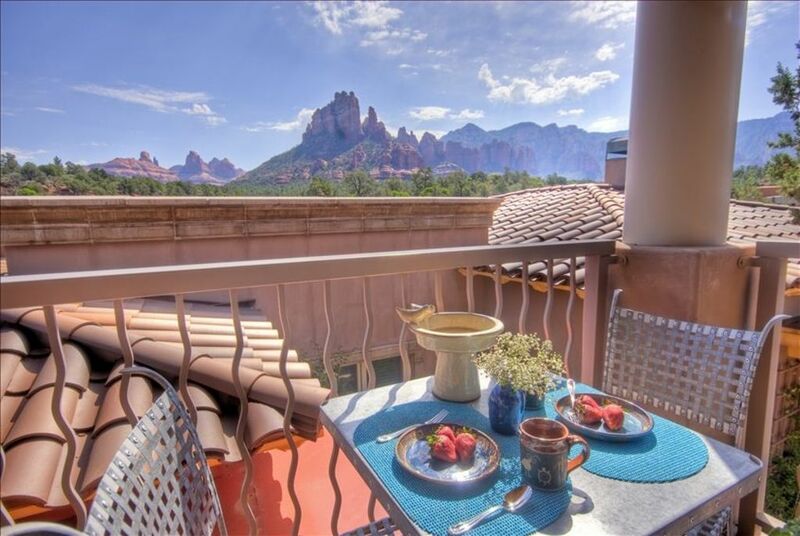 Perched high on a hillside above Sedona's exclusive Gallery District, Casa Cielo (House of the Sky), features unobstructed views of Sedona's famous red rocks and clear blue skies. The 680 square foot stand-alone carriage house is located a flight of steps above your convenient, on-site designated parking spot. Enjoy romantic seclusion and no common walls with the main house. Your carriage house is ideally situated within easy walking distance of Sedona's Gallery District, with its fabulous shops, galleries, restaurants. Oak Creek and Marg's Draw National Forest trail head are within easy walking distance. Secluded and peaceful, it is the perfect adult non-smoking retreat. Your romantic carriage house (new, high-end construction) features red rock views from every window. (Yes, even your toilet!) It has environmentally friendly gleaming hardwood floors, natural fiber area rugs, a living room fireplace, deluxe king-bedded master suite and memorable views. A private balcony off the master bedroom and deck off the living room add to your guesthouse's charm. Bubble in a two person jetted tub in your immaculate en-suite bath with its red rock views. A 50'' flat screen LCD TV/DVD in your great room, a 37" flat screen in your master, and stereo system as well as an iPod/MP3 docking area supply all your media needs. Enjoy panoramic vistas from your living area with French doors that open wide unto a private covered deck. A fireplace topped with a 50 inch flat screen TV make for cozy evenings at home. Original art, pottery and paintings grace the space making the ambiance anything but institutional. Your open floor plan kitchen comes fully stocked and includes a dishwasher, microwave, blender and coffeemaker. Antique dishes complemented by hand-crafted pottery and serving pieces make your meals memorable. View the fireplace, flat screen TV and the red rock views beyond from the sink! Generous prep areas and an outdoor gas grill complete this cook's dream kitchen. Your private deck has comfortable plantation seating for sunrise, sunset, and night sky viewing. A bistro table makes sunny morning coffee a joy. Your gas grill BBQ completes the space. The rooms are heated and cooled by a central system that you control as well as a gas fireplace for atmosphere in cool weather. Fully wired, you have a complimentary top-of-the-line high-speed WiFi hookup. Your serene master bedroom features a deluxe eastern king bed with fluffy non-allergenic down bedding, high thread-count linens and a second flat screen TV. A convertible queen sofa is available for an additional guest. A washer and dryer complete your carriage house's luxury amenities. Savor fabulous sunrise and sunset views from your master's private Juliet balcony or your covered living room deck. View birds and wildlife in the wild arroyo beneath the property. Sip champagne from the sparkling adults-only outdoor hot tub located on a secluded view deck. Screened by a large boulder and 14 foot foliage, it features panoramic red rock vistas and star-studded night skies to make your romantic stay complete. National Forest trail head are within easy walking distance. Your romantic hideaway contains a notebook full of information to help you plan individualized itineraries for all your art gallery, hiking, vortex, spiritual, horseback, hot air balloon, golf, fishing, wine tasting, day trip and Grand Canyon expeditions as well as maps, directions and restaurant advice. The property manager is often on premises or is an easy phone call away to provide prompt personal attention and concierge information. Keywords: Panoramic views. Private and secluded. Oversized jetted tub for two in immaculate en-suite bath. King-bedded Master with fluffy non-allergenic bedding and high thread count linens. Fireplace. Open floor plan. Large flat screen TV’s in great room and master. Private view deck with gas BBQ. Fenced property with lounges for sunbathing. Secluded and screened by 14 foot high vegetation, sparkling, adults-only outdoor hot tub. Easy stroll to nearby dining, galleries, creek and trails. Carriage house up one flight of steps from convenient, on-site designated parking. Private entrance; no common walls with main house. Excellent, free phone and WiFi connection. Private washer & dryer. Deluxe two person jetted tub with lovely red rock views . WaterPik shower head in the combination tub/ shower. Granite sink counter with lots of storage drawers. Separate water closet. Steps to private washer & dryer. High thread count luxury linens. Personal washer and dryer in the unit. Gas fireplace in Great Room. Reserved private on-site parking spot located as close as possible to your unit. Secure, indoor golf club storage. Lots of thick, fluffy towels. Oversized beach towels included. High-end 50 inch flat screen in great room. 37 inch flat screen in master bedroom. Secure fenced garden with seating, sun lounges, and superb views from property's common area. Great photo opportunities. Juliet balcony off your master bedroom with stunning red rock views. Private, covered deck off your great room. Outdoor seating, cafe table and outdoor grill. Stunning views and photo opportunities. Free tennis located a mile away at the Posse Grounds. Shared adults -only outdoor hot tub with 14' shrubs for privacy screening. Shared with two other couples maximum. We really loved Fran’s place last week. It was a perfect location and was very private yet close to everything we needed. We were really happy that we chose this place over a hotel since it was fully equipped. Spectacular views just as shown in the photos. Thanks for an awesome week celebrating our Anniversary!! The location and views of the red rocks are amazing. It is well stocked and has everything you may need. The fireplace and the jetted tub was exactly what we needed to complete the relaxing experience. Would definitely come back and stay longer. Fran is very helpful and welcoming! Amazing view! We got to enjoy nature even when we weren’t out hiking in it! Fran was great. This was our first trip to Arizona (celebrating our first anniversary). We had the best week ever. The space is beautiful, pristinely clean, comfortable, and well-appointed. Franny was wonderful! Warm, kind, very informed. She made us feel like we were her old friends. She gave us lots of great tips about where to eat (and where to find gorgeous jewelry!). We usually request a five to seven night Saturday through Saturday stay in spring, fall, and during holiday periods.